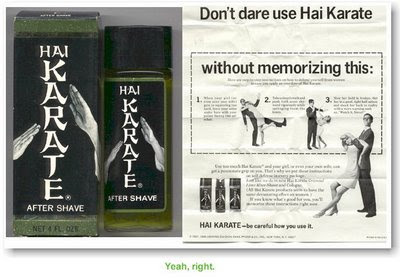 Striking Thoughts' recent mention of Scotty Karate ale immediately brought back memories of another product hawking the karate monicker: Hai Karate aftershave and cologne. Touting to possess aphrodisiac-like qualities, wearers were advised to use caution when out and about and self-defense instructions on how to fend off frenzied women were included. Maybe this stuff had pheromones in it. Hai Karate debuted in the 60s, and I actually recall having a bottle or two of this around as a kid. Isshinryu karateka please take note that the image of brandishing shuto hands that appeared on the package belonged to none other than Hanshi Ed McGrath. On the gift box set he's shown full view performing a flying side kick. Check out this TV ad from 1967. Anybody from my generation remember this? Haha! Great post. Love the commercial. Completely sells it. Oh man, I am so there! I watched all these adds, and my uncle actually used the stuff. I had to try it when I was about 12. What a great blast from the past. gym kata and hai karate! It's amazing how certain advertising tactics don't change. Axe body spray does the exact same thing. Even their packaging contains warnings about likely female interaction. Needless to say I own axe body spray. Hysterical-a bit before my time, but very funny. I can smell the reek from here!